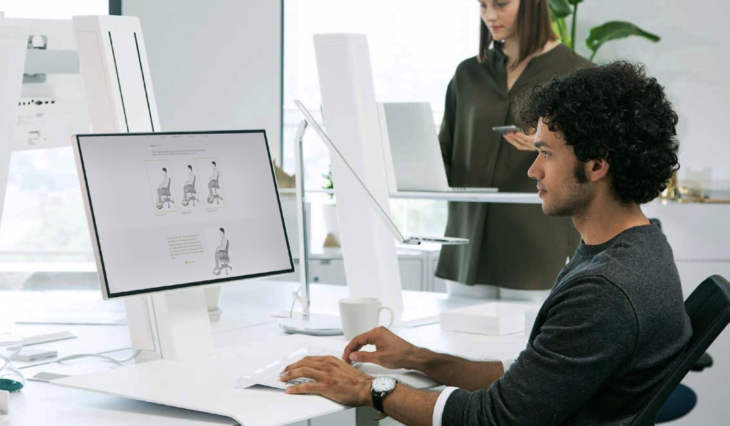 by Brianna Crandall — November 19, 2018 — New from Humanscale, ergoIQ aims to improve workplace well-being by bringing expert ergonomic advice directly to professionals and practitioners. As the modern office evolves with the rise of highly adaptable and connected workspaces, so too must ergonomics, says the ergonomic products designer and manufacturer. ergoIQ’s simple, online interface is designed to seamlessly guide individuals through an audit of their workstation, and depending upon their current equipment, offer tailored adjustments in real time. Designed as an initial assessment method, ergoIQ is a cost-effective, scalable tool that businesses can leverage to save time and resources associated with traditional, onsite ergonomic consultations (reducing costs as much as 90%). Recognizing that most people do not fully understand how to apply ergonomic principles to their workstations, ergoIQ’s intuitive Q&A (question-and-answer) format and straightforward visuals are designed to make it highly accessible. More than simply pinpointing specific workstation adjustments, ergoIQ takes the process a step further by providing a comprehensive Fit Score. This detailed report conveys how well current work tools are fitted to the body in categories such as seating, monitor alignment and lighting. When analyzed, this data offers a more accurate and nuanced picture of an organization’s ergonomic health. By digitizing the ergonomic consultation, ergoIQ offers strategic program management for human resource (HR) professionals, facilities managers (FMs) and workplace strategists. With the aggregated Fit Score, ergoIQ helps identify specific needs for more formal, in-person ergonomic assessments. It also tracks overall improvement levels across multiple facilities, saving hours of administrative work. By automating equipment approvals and procurement, ergoIQ helps to streamline workflows. Companies can even customize the program to include pre-approved tools and vendors. Our team of certified ergonomists has first-hand experience managing the inefficiencies of today’s ergonomic assessment programs. Our clients have been struggling to keep up with assessment requests and equipment-related problems for years. Current approaches are filled with dozens of manual processes that translate into lengthy delays and leave employees working with unacceptable discomfort levels. Our team saw an opportunity to streamline the process by merging the knowledge of experts with technology. Almost every component of the assessment process ranging from employee training and education to reporting to managing approvals has been addressed with ergoIQ. For more information on the ergoIQ tool, visit the Humanscale website. Humanscale leverages new technology and functional design to transform traditional offices into active, intelligent workspaces and improve the health and comfort of work life. The company is committed to making a net-positive impact on the earth as well as customers with its award-winning products.